The first time I watched that old Disney classic, The Black Stallion, I remember thinking (like everyone else, I'm sure), how much better it would be if the boy was a Viking and the horse was a Dragon. And if Mickey Rooney wasn't in it. 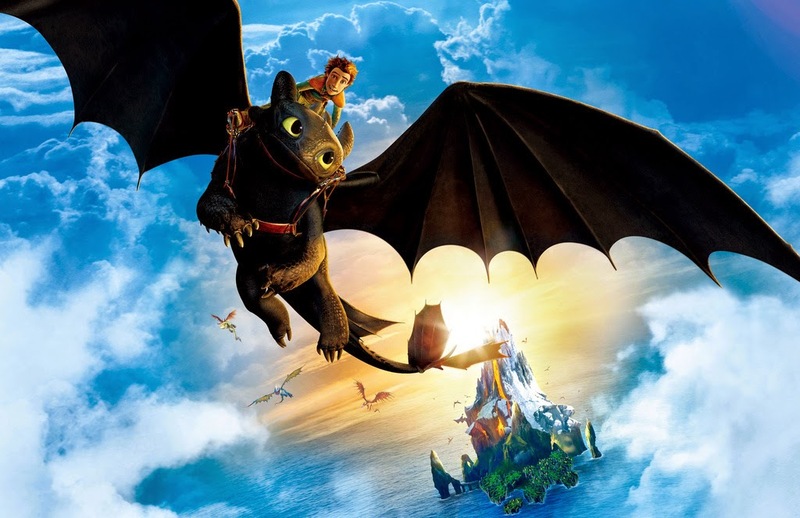 Over 30 years passed before we finally got that film in the form of How to Train Your Dragon (Dean DuBlois & Chris Sanders, 2010), based on the books by Cressida Cowell. 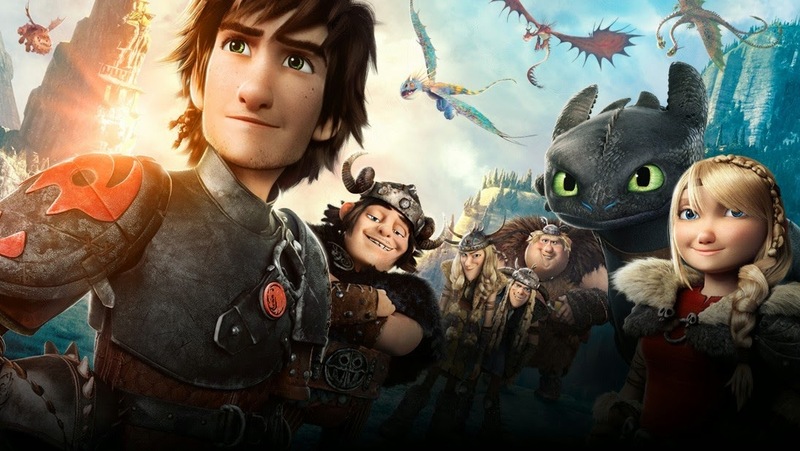 Our hero is an ineffectual teenage Viking named Hiccup, struggling to live up to the expectations of his father Stoick, a Viking chief who protects their village from regular raids by fearsome dragons. Things are further complicated when Hiccup befriends, rather than slays, a wild Night Fury dragon, which he christens Toothless. Together, they try to convince the rest of the Vikings that they can live in peace with dragons, rather than fighting them. Obviously, this proves easier said that done, so they must also embark on several hair-raising adventures, particularly during the exciting climax, in a series of action sequences which are just brilliantly realised. The ace in the pack is Toothless himself, a sort of cross between playful puppy, dive-bombing bat and sleek feline killer. He's a marvellous creation, both fearsome and adorable, and the relationship between boy and dragon provides the heart in the quieter moments of character development. It's not quite as funny as it could be, with some underdeveloped comic supporting characters, but this is still a rousing action-adventure, with plenty to entertain kids and adults alike. And, thankfully, there's no sign of Mickey Rooney. So if the first one was The Black Stallion, How to Train Your Dragon 2 (DuBlois & Sanders, 2014) is The Black Stallion Returns, right? Well, not really, because The Black Stallion Returns is pretty terrible. A better touchstone here, according to the directors, is The Empire Strikes Back, as this is intended as the middle section of a planned trilogy and introduces some serious issues to challenge our heroes with, with no guarantee of everything ending happily. Set five years on from the first film, its characters have grown believably and it has fun expanding the world of its predecessor to explore new, visually stunning lands. It doesn't quite have the charm of the first, but there's more plot, more excellent action sequences and more dragons, including a Big Stompy Smackdown between some hugely impressive beasties, which might prove a little intense for younger viewers. And, to be fair, the directors are prepared to deliver a couple of dark moments, which were hinted at in Hiccup's fate at the end of the first film, and which are here developed in plot-lines which threaten the relationship between Hiccup and Toothless, thereby giving it all a bit of emotional heft. It's a worthy sequel and another very enjoyable action-adventure. Still no sign of Mickey Rooney either, so all is well. The critical and commercial success of both films means we will inevitably have a third instalment to look forward to and, should it deliver on the promise of the above duo, we'll have a very good animated trilogy to plunder the space on the shelf next to the Toy Story gang. 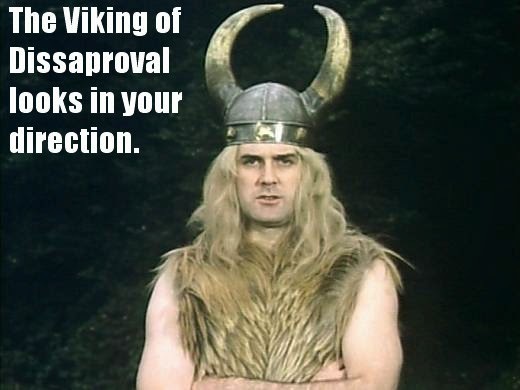 Incidentally, I could fully empathise with Hiccup because back when I was a Viking, I wasn't rated as a dragon-slayer either. My job was to gather population data following the regular dragon raids and log it on the town register. I remember one day getting an earful from the irate wife of a famous Viking explorer who had returned home from a dragon-slaying quest and found his name missing from the list. "I'm so sorry", I said, "I must have taken Leif off my census."